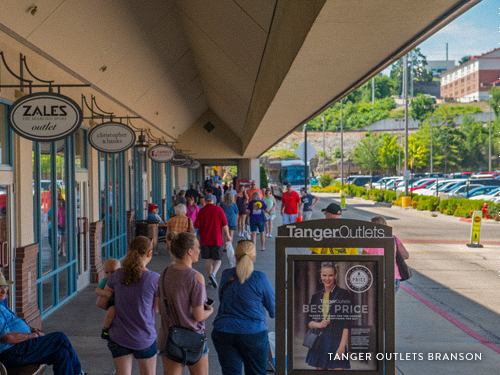 Bargain hunters and savvy shoppers rejoice — Branson is home to not just one, but two open-air outlet malls: Tanger Outlets Branson and The Shoppes at Branson Meadows. From top-notch brands to one-of-a-kind finds, each of these Branson shopping destinations have the best deals and deepest discounts in town. Here are some must-stop-shops, tips and tricks to get you prepared for a great day of shopping in Branson. Just a 10-minute drive from downtown Branson, Tanger features more than 70 shops. At a whopping 30 to 70 percent off retail prices, these discounts are among the best in Branson. Designer stores like Vera Bradley, Coach and Fossil are favorites among fashionistas. While jewelers like Kay, Helzberg and Zales offer remarkable markdowns on their finest gems. Specialty shops can be found here too, from the enchanted Disney Store to beloved Branson eats and treats like Mick’s Nut Shack and The Fudgery. Need a new outfit? An impressive collection of recognized brands like LOFT, American Eagle, Oakley, Eddie Bauer and more are waiting to be discovered. Find adorable attires for your little ones at OshKosh B'gosh, the Children’s Place and Carter’s, or shop major brands with departments for kids and young adults, like Gap, Old Navy and Tommy Hilfiger. From designer accessories to brand-name apparel, find exactly what you’re looking for at Tanger Outlets. • From downtown Branson, take US Highway 76 (West Main Street) west and veer left onto W 76 Country Boulevard. Turn right onto Tanger Boulevard. • From Springfield, take US-65 South and exit MO-76 W/ West Main Street. Continue onto W 76 Country Boulevard. Turn right onto Tanger Boulevard. Between 15-plus retail stores, a charming restaurant and an impressive movie theater, it’s easy to spend a full, fun day at this Branson outlet mall. The Shoppes at Branson Meadows is a treasure trove of home goods and housewares. For any kitchen and cutlery needs, stop into Shepherd of the Hills Cutlery, World Kitchen Corning, Kitchen Collection or FEB Food Service Equipment. Discover stylish home accents, décor, linens and more at Tuesday Morning, Ozark Quilts and Neill’s American Mattress Store — where there’s more than just mattresses in stock. After shopping at The Shoppes at Branson Meadows, stop in the Branson Meadows Cinema to check out what’s new on the big screen! • From downtown Branson, take Branson Landing Boulevard north and continue onto MO-248 W/Shepherd of the Hills Expressway/Gretna Road until it becomes Gretna Road; turn left onto Motley Drive. • From Springfield, take US-65 South and exit MO-248 W/Shepherd of the Hills Expressway Gretna Road until it becomes Gretna Road; turn left onto Motley Drive. Check out more Branson shopping here!